Today is the publication date of Marx Brothers Council of Britain blogger Matthew Coniam’s seminal work on all the references and in-jokes in the films of the Marx Brothers. The book is being published by McFarland and can be bought directly from the publisher here! I’ve preordered my copy on Amazon and I can’t wait for it to arrive. Although I’m a trained historian, I know far from everything and I know there are tons of references I’m missing when I watch these films, so I’m really excited to do a rewatch with the guide in hand. Sure, most people know about Strange Interlude, for example, but for every reference modern audiences still get there are at least five more we don’t! 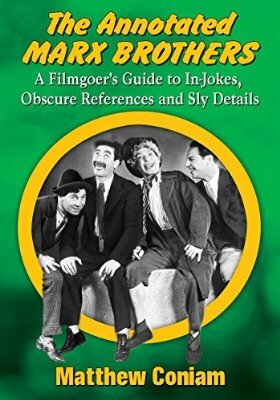 As a member of a Marx Brothers Facebook group, I’ve seen the work that has gone into this book and I can confirm that Matthew and his team have worked tirelessly to bring us this extremely important book. I may not have my copy yet, but I’m already recommending this to you. Seriously, go buy this. If you’re a fan of the Marxes you won’t regret it.